Place 1 tea bag into. Pour 90ml of hot water. Allow steep for 3-5 minutes depending on personal preference. Remove tea bag. Add ice cubes to 180cc and enjoy. Ingredients: Sugar, Non-Dairy Creamer (Glucose Syrup, Hydrogenated Palm Kernel Oil, Sodium Caseinate, Potassium Citrate, Glycerin Fatty Acid Ester, Black Tea, L-Arabinose. 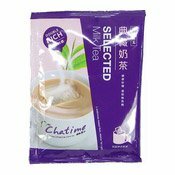 Simply enter your details below and we will send you an e-mail when “Selected Milk Tea Drink (日出茶太典藏奶茶)” is back in stock!